Law Dean David Meyer (left), with Alumni Award Honorees retired Judge Thomas Wicker Jr. (L'49), Dr. Linda Wilson (NC'57) and past president of Radcliff College; and Judge Ian Forrester (L'69). 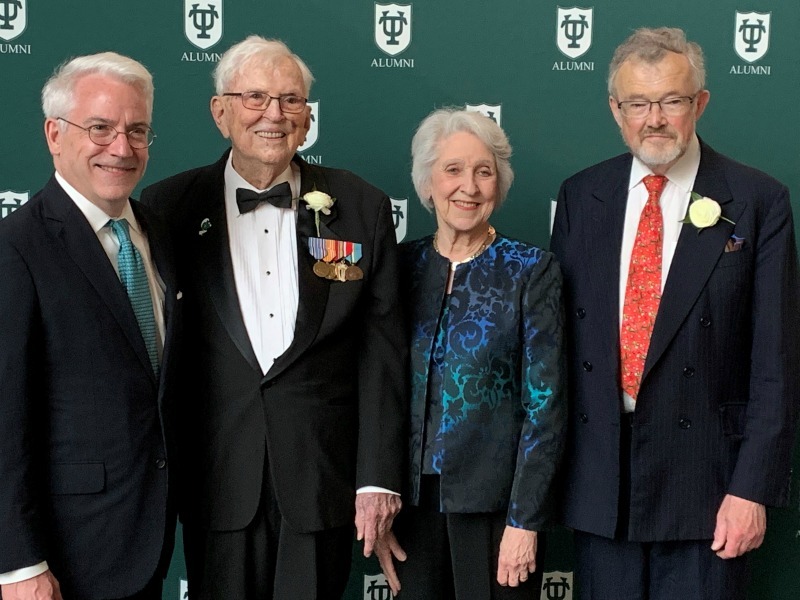 Distinguished alumni of Tulane Law School were honored April 6 for their work, dedication and service on behalf of the community during the Tulane Alumni Awards. The Tulane Alumni Association has created the awards to celebrate dedicated alumni, which are the pride of Tulane University. This year, four of the nine recipients are graduates of the law school, and have contributed in a variety of ways to the betterment of the university and community. Darryl D. Berger (L’72) is an immediate past Chairman of the Board of Trustees of Tulane University and a long-time member of the law school’s Dean’s Advisory Council. He wil receive the Dermot McGlinchey Lifetime Achievement Award. Robert Cudd (L’60), along with his wife, Carol, will receive the Bobby Boudreau Spirit Award. Robert Cudd is a long-time attorney for whom the Law School’s Robert Cudd Professorship in Environmental Law is named. Judge Ian Forrester (L’69) has been an academic teacher, author and practitioner and a member of the General Court of the Court of Justice of the European Union. He will receive the International Award for Exceptional Achievement. Judge Thomas C. Wicker (retired) (L’49) received a bachelor’s from Tulane and immediately shipped off to war, returning in 1946 to attend Tulane Law. Judge Wicker is a dedicated Tulanian who has served as U.S. Attorney, District Court and Appeals Court judge. He will receive the Scott Cowen Service Award.